Several hundred communists and socialists will run for public office on the Democratic Party ticket this year. 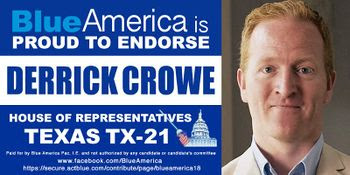 One of them is Derrick Crowe, who is vying for a seat in the U.S. House of Representatives, from Texas Hill Country’s 21st Congressional District. 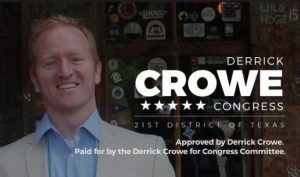 Despite running as a Democrat, Derrick Crowe is a member of this country’s largest Marxist organization, Democratic Socialists of America (DSA) – a fact not revealed in his campaign literature. The leadership of Our Revolution, a several hundred thousand strong DSA-Front organization, has also endorsed Derrick Crowe. District 21 is based in Texas Hill Country just north of San Antonio. It is an open seat with 4 Democratic primary candidates and more than a dozen Republicans. It’s been a safe Republican seat, represented by Lamar Smith and is considered unlikely to flip this election cycle. The fact that Derrick Crowe has the support of approximately 900 DSA members in the San Antonio/Austin area and if he wins the primary – more than 30,000 comrades nationwide – may make for some surprises. 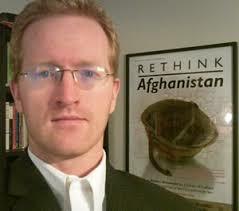 Derrick Crowe’s website bio portrays him as a guardian of America’s national security. “Derrick worked in Washington, D.C. for senior Democrats, including House Democratic Leader Nancy Pelosi (D-Calif.) and the top Democrats on agriculture (Charlie Stenholm) and counter-terrorism (Adam Smith). As a staffer, he contributed to the defense of Social Security and Medicare against Republican privatization pushes. As a senior communications professional, he participated in the messaging effort that helped Democrats retake the House in 2006. He also prepared senior Democrats to serve as national security surrogates for then-Senator Barack Obama‘s presidential campaign. “Concerned that Washington, D.C. was aligning behind a military-first solution to a political problem in Afghanistan, Crowe left the Hill and eventually came to lead the Rethink Afghanistan project at Brave New Foundation (now Brave New Films). He won a reputation as a fierce advocate for reigning in military spending and bringing our troops and tax dollars home from wars that aren’t making us safer and aren’t worth the cost. In reality, Crowe was an activist and propagandists for the anti-American, anti-military Obama/Peolosi agenda. He also worked for several covertly socialist organizations, pushing their Marxist agenda. “At the Center for Public Policy Priorities, Crowe advocated for low- and moderate-income Texans, supporting legislative agendas that benefit everyone, not just those at the top. That work followed similar efforts at the Children’s Defense Fund in Washington, D.C. He has partnered with Black Lives Matter in the past and continues to work to fight racism. Sometimes Derrick Crowe’s radicalsm bubbles over in public. Several people gathered to protest proposed Republican changes to the Affordable Care Act outside GOP Senator John Cornyn’s office on Thursday, July 6, 2017. Demonstrators waved signs, led chants and blocked the sidewalk in opposition to the Senate GOP plan to overhaul the Affordable Care Act, which would slash coverage for many and the taxes that help pay for it. I joined a several local groups (ADAPT, Central Austin People Power, the Austin Democratic Socialists of America chapter of the Democratic Socialists of America, Indivisible Austin, Left Up To US, Our Revolution – Central Texas, Our Revolution – North Austin, Texas Alliance for Retired Americans-Austin, Texas Drought Project, and others) at a rally at noon today in front of Cornyn’s office to say no — no to the attack on the sickest, most vulnerable people in our community, and no to the politics of extreme greed that brought this legislative atrocity to life. Derrick Crowe is a crypto-communist running as a Democrat. His campaign is deceptive in nature and needs to be exposed. Please help spread this information throughout Texas District 21 and beyond.